We had the Company Christmas Dinner last night. Food by Max's was very good. Entertainers were the comedians Anton and Hans. Overall the program was okay. Wasn't as much fun as the previous years though. Last year we had the Fantaserye departmental competition and it was a riot! This year we won second place for the departmental HOM presentation contest! This is largely due to the "Love Affair in September" video which was so very funny and well applauded. I took some shots of my present piano setup so I might as well post them here. The pic at the left is with the piano closed and the right with it open. The piano didn't come with a cover. So what I did was to build one using the piano's carton box. He! he! Clever, huh? I had to cut down the box coz it was too big. It had to be much bigger than the piano coz it had styrofoam at the corners. That was the tricky part. Fashioning the final box to fit the piano just right took so much measuring, cutting and folding. The rest was just to wrap the box with nice gift wrapping paper with neutral colors. I used a "Winnie the Pooh" design with light brown background. Then wrap the entire thing with heavy duty plastic sheet. 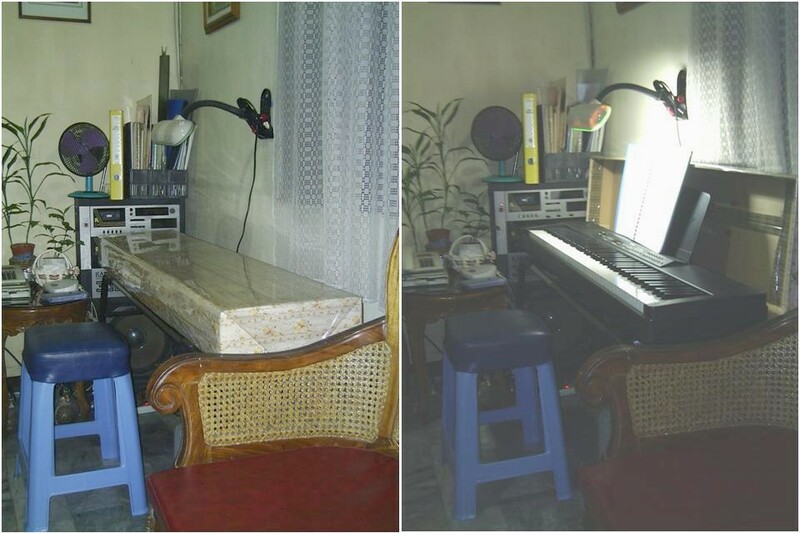 To open the piano, just flip the box up and rest it against the wall as shown on the right pic. I took the idea from the standard flip-top box of the Marlboro cigarettes. The piano stand came with the piano on sale. It's got adjustable legs for height but is now at its lowest setting. The piano doesn't come with built-in speakers and so I used an old karaoke system for my speaker. On top of the karaoke are the music books. That round black thing near the books is a mini electric fan. We want to stay cool while practicing, don't we? Lighting: For this, I screwed on the wall a fluorescent lamp with an adjustable neck. I used to have a small desktop lamp but it took too much space ON the piano. The pic on the right shows the lamp turned on and it floods the entire keyboad with light. The music sheet is well lighted too. Seat: That stool is a standard monobloc stool. Nothing fancy, though I had to search high and low for the right height. We then had the seat part upholstered to put cushioning (dark blue cover). Hopefully this will make piano playing more comfortable for everyone. That's it! Like I said, nothing fancy, and it works for us! Well thanx! The plants? I don't know... They sort of look tall and skinny to me.